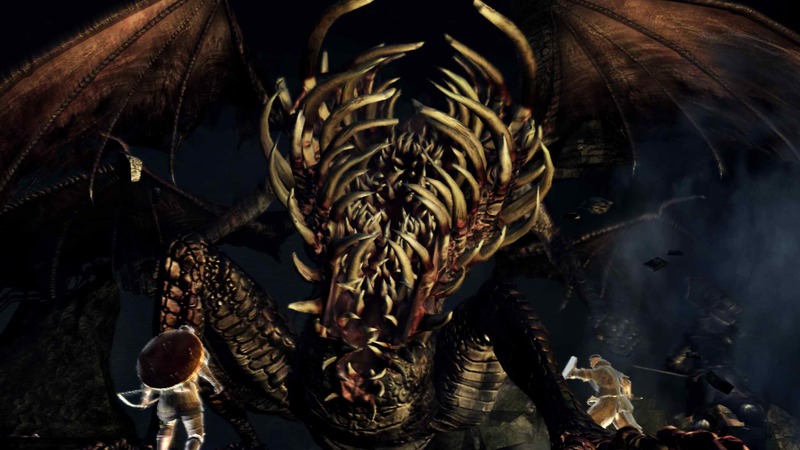 Dark Souls, the sequel to From Software’s Demon’s Souls, is a nightmarish purgatory of a game. It’s an experience where you are small and weak and everything else is deadly and unspeakably powerful. You will come across overwhelming odds, you will falter, and you will die horribly countless times. But despite the unrelentingly punishing nature of your task there is always hope. Even when you’re trapped, lost in some poisonous swamp in the lowest reaches of the world, unable even to see the sun, there is always hope. You will get smarter, you will get better, and you will come back time and time again to face the overwhelming odds. Because this isn’t just a hard game – it’s a fair game, and the extreme difficulty you face only serves to make the experience more memorable, and the world more haunting. You take on the role of an undead warrior cast into a dead land. After a brief and bloody tutorial you’re released into this open world, with very little introduction or guidance. So you explore, and you find winding paths, hidden routes, and great open areas filled with dangers. The threat of death is ever present, and if you don’t learn to protect yourself from the many monsters and fallen humans that inhabit the land you will fail repeatedly. And while the combat has relatively simple foundations it allows for amazing complexity and depth. Everything revolves around positioning and stamina – attacks, dodges, and blocks all drain stamina from your slowly-regenerating reserve, and if you run out you’ll drop your guard, leaving you painfully open for a few seconds while you catch your breath. Fights are fast, heavy, and tense as all hell, and half the time you’ll be limping from one disastrous encounter into the next. Enemies come in different shapes and sizes – from the most standard undead human to many-headed lighting-spewing hydras that tower far into the sky. And each, from that hydra to that lowly zombie, will kill you in a few blows if you’re not careful and precise. You have to learn their weaknesses and their tells in order to best them, and this is far easier said than done. But once you best them you’ll collect your reward, which comes in the form of souls. As you harvest souls from fallen enemies you can use them both as currency and as experience points used to improve your abilities. Souls are vitally important throughout the game, and you have to be careful because if you die all your unspent souls are dropped where you fell, forcing you to go back through the level and retrieve them. Die again before you can retrieve them though, and they’re gone for good, meaning you’ll lose a good deal of progress, and probably start tearing your hair out when things go really badly for you. But throughout the world there are bonfires – places where you can rest, use your souls to upgrade your character, and where you will return to when you die. There is a downside though – when you do rest at a bonfire all the enemies in the current area will come back to life to threaten you again and again. But the bonfires are important safe havens, and since there are only a few scattered throughout the game, each separated from the others by great distances, every discovery of a new bonfire spurs a genuine and powerful sense of relief. The world is sprawling and wide, with the lack of loading screens meaning you can walk from the highest point in the land to the lowest without interruption. Each part of this world has its own architecture, and is filled with its own unique dangers. Some of these places are more deadly than others, so it’s smart to approach these areas first as you find your feet. But the game doesn’t tell you this, and in fact the game rarely tells you anything at all. You’re left to figure it all out on your own, and this ballsy lack of hand-holding makes the act of exploration more dangerous and alienating, since you never know what you’re going to come upon, or what’s going to come upon you, next. This lack of hand-holding can lead to problems, however. In the early game it can be extremely difficult to figure out how everything works. 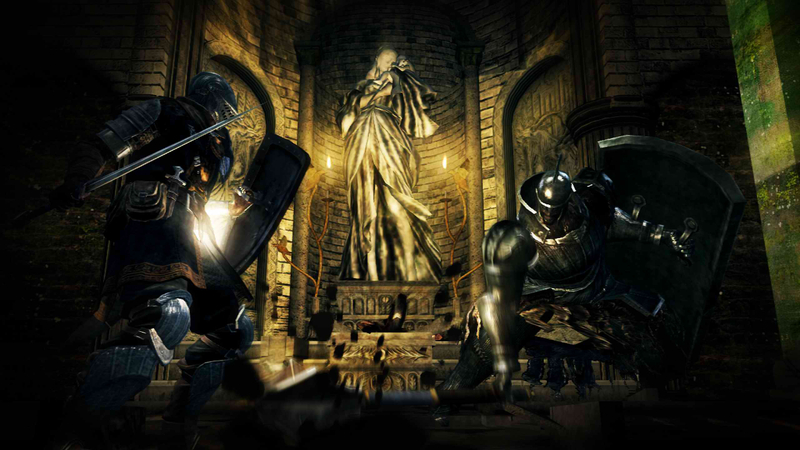 Many aspects of Dark Souls will be almost impenetrable to newcomers to the series. Getting past this and mastering the game is extremely satisfying, but it simply needs to explain itself better to beginners in the first place. This is especially true since Dark Souls is wholly unforgiving, and demands you be cautious and smart at all times since rushing into combat will result in you being killed by even the weakest enemy within seconds. This lack of hand-holding can lead to problems, however. In the early game it can be extremely difficult to figure out how everything works. Many aspects of Dark Souls will be almost impenetrable to newcomers to the series, and it simply needs to explain itself better to beginners. And despite the openness of the world you occasionally come up against artificial barriers, and the method of progressing in some areas is just too unclear. For example, there’s one vital route that the player can only reach by climbing a small, out of the way ladder. It’s amazingly easy to miss this, as I did, and you can’t complete the game without eventually finding it. So while the game’s world is generally fluid and organic to explore, occasionally it’s designed in such a way that important things are just too opaque to anyone without an online strategy guide at their disposal. So while the lack of hand-holding generally enhances the game by keeping you afraid of what’s round the corner, it can sometimes lead to unnecessary frustration. As I mentioned above, the game is extremely difficult, but fair. You will die a lot, and enemies will sometimes seem insurmountable obstacles, but each has a weakness that you can learn to exploit. Progress is determined by your ability to learn about the game’s mechanics, the enemies, and the layout of the environments, rather than your ability to grind experience points for hours on end. So each death serves a purpose, since it gives you more knowledge about how to avoid dying in the future. And Dark Souls never demands that you perform some superhuman feat of hand-eye coordination. It’s all about patience, knowledge, and knowing when to push forward and when to pull back. There are, however, a handful of moments throughout the game (which should last between 20-50 hours on a single playthrough) where something is extremely, unfairly difficult for no good reason. One segment later in the game especially acts as a deliberate ‘screw you’ to the player. This one short segment took me literally hours to get past, and from looking online it’s clear pretty much everyone had the same experience. I’ll praise the difficulty in Dark Souls for the compelling and fair challenge it brings, but once every so often things get hard for simply the wrong reasons. But though the game is at times overwhelmingly hard, there is a fascinating crutch present for any player finding things beyond their capabilities. when you’re connected to the internet Dark Souls allows you to summon other players into your world to help you progress (or vice versa).You can’t communicate with other players – they’re there to help you with some vast and terrifying endeavour, and once they’ve done so (or once you fail) you watch them slowly fade away and return to their own world without the possibility of a word of thanks or goodbye. But players don’t always seek to help each other. The opportunity also exists for hostile invasions, and this can happen at pretty much any point throughout the game. These invaders get many souls if they manage to murder you, so they’ll do everything they can to hunt you down. Every time I was invaded I was gripped by a powerful sense of dread, and each battle with an invader was so intense it’s been seared into my mind. The fact that this can happen anywhere means that you can never let your guard down. Not only is pretty much everything in the game trying to kill you, but people can come into your game and murder you at any point. It’s a thrilling addition to the game, just as it was in Demon’s Souls, and I’ve yet to see another game with such a fascinating online system. This interaction with other players feeds into the strange, purgatorial atmosphere I mentioned in the introduction. And this atmosphere that Dark Souls builds and maintains throughout is one of its greatest triumphs. The game is violent and horrific, but it’s never hellish – the constant cycle of death and resurrection at the bonfires, the brief, silent interactions with other players, and the disjointed, barely-present story, all make the world feel like some kind of violent purgatory. And as you move through the game you’re always trying to make a little more progress, trying to understand a little more, so that you can eventually find a way out of this alien land. The few characters you encounter – some valiantly trying to do good in this broken world, but most simply hiding or trying to survive – further add to this atmosphere. Any interaction you may have with them is brief, limited to hearing a few lines of (often poorly acted) speech. But they’re generally enigmatic beings, and their presence hints at other stories and truths, leaving you to make your own inferences about what happened in the past in this now-lifeless land. And the bare, simple stories surrounding locations or characters sometimes come together later in the game to become genuinely poignant vignettes. The game is generally a triumph of understated, environmental storytelling over exposition-filled narrative. But towards the latter half of the experience, the game does make a few missteps in this field. At several points the understatement and minimalism is gone and we’re given (generally quite poorly written) fantasty trope-riddled prose. As a result the game sometimes falls into somewhat generic territory, with reference to long, complex names, ancient prophecies, and the like. It’s here that Dark Souls falls down, to a greater extent than Demon’s Souls ever did, but for the vast majority of the experience the game perfectly balances its mysterious, minimalistic approach to storytelling. 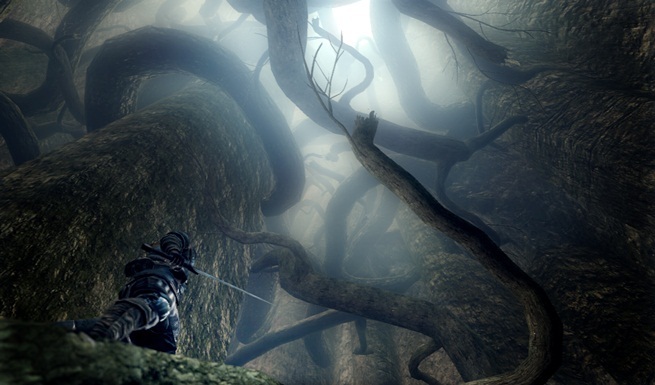 Throughout, Dark Souls faces the player with a startlingly well-realised world. Everything – every single piece of the game from its eerily beautiful environments to its combat mechanics – works together to build this phenomenal vision. There are a few missteps – it’s sometimes just too opaque, it’s sometimes frustratingly unfair, and it sometimes loses sight of what makes its world fascinating to begin with – but this is really one of the most special games I’ve played in a great deal of time. It’s horrific, tense, and genuinely terrifying at times. You’ll spend countless hours trapped in that poisonous swamp at the bottom of the world, but then you’ll look up and know that the sun is shining up there. The hope that you’ll see it again will always be there, and you’ll look around you and notice that there is a real beauty, and even a kind of peace in this unrelentingly bleak world. This entry was posted in Games Blather and tagged Dark Souls, From Software, Games of 2011, Review. Bookmark the permalink.